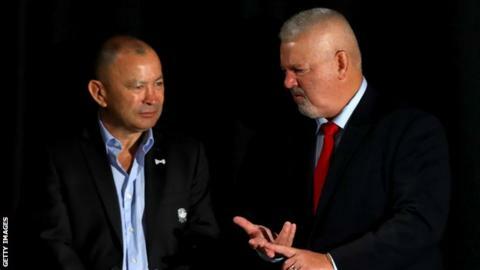 Wales head coach Warren Gatland has laughed off the suggestion from his England counterpart Eddie Jones that this is the "greatest Wales side ever". Jones made the quip, seemingly tongue-in-cheek, before the two sides meet in the Six Nations in Cardiff on Saturday. Both teams have won their opening two matches, while Wales are on a record 11-match winning run. "The only quotes I can see about this being the greatest Wales team are from Eddie Jones," said Gatland. "It hasn't come from anyone else so I wouldn't be disrespectful enough to say this was the greatest Welsh team ever. "It's a long way off being the greatest Welsh team ever. He's the one talking us up." Is this really the greatest Wales side ever? Jones has been typically provocative in the build-up to Saturday's crunch encounter at the Principality Stadium. The Australian claimed on Thursday that Wales were the favourites to win in Cardiff, even though the common consensus is that his are the form side in the Six Nations this year. England started their campaign with a stunning bonus-point victory over reigning champions Ireland in Dublin and they followed that with a ruthless 44-8 demolition of France. Although Wales have also won both of their fixtures so far, they have done so in a less convincing manner, coming from behind to beat France before stuttering to victory in Italy. Beating England would see Wales set a new national record of 12 successive wins, and Gatland believes their opponents could be in for something of a culture shock in Cardiff - and on their journey to the Welsh capital, having decided to travel to Wales the day before the match. "The big challenge for England is five of their forward pack, it's the first time they're starting at the Principality Stadium," the New Zealander said. "I think England are making a significant mistake by travelling tomorrow, coming through Newport at about five o'clock is probably not the best thing to be doing, going through the Brynglas tunnels. "There's a good chance there could be tractors and buses holding them up. That's going to be an experience for them." While hyped as usual, the build-up to this fixture has been good-natured, which Gatland believes is now commonplace for the Wales-England rivalry. "We haven't spoken too much about them. It's been a focus on us, training hard the past few weeks," he added. "The great thing about coming to Cardiff is the atmosphere. If there was any animosity in the past, that's all gone. "There's a huge amount respect between the players from both teams. With the Lions, the Welsh boys and English boys got on really well. Some fantastic individuals, not just as players but as men. "I've already had a text from John Mitchell and Eddie saying they're looking forward to catching up after the game and having a drink. "This is all fun and games now but afterwards it's about catching up with some mates and enjoying the occasion." The roof at the Principality Stadium will be open for the match, per England's request. Both teams have to agree to a closure, which was Wales' preference.